All inclusive offering provides complete monitoring and management of your entire infrastructure, including desktops, servers and network devices. Includes threat protection, patch management and backups for desktops and servers, from licensing, system configurations, complete administration and reporting. Utilizes industry leading tools and software, partnering with Microsoft, Commvault®, Sophos and more, to provide a secure and protected environment. Backup and restoration services for both workstations and servers. We utilize direct remote backup for workstations and an on-premise backup for large amounts of data generated on file servers, databases, and other applications. Our selected toolset utilizes Disk Image Backups of whole virtual (and sometimes physical) machines, and backup and restoration is performed using an on-site BDR. 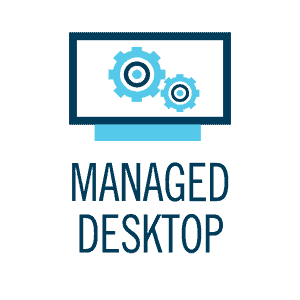 Our Managed Desktop solution ensure desktops are secured, managed and patched. All infrastructure, software, management tools and management effort is included in the solution to ensure desktops are optimized, protected from Virus outbreaks and patched on a monthly basis to ensure compliance. Windows Server Management supports Windows Server 2008, 2012, and 2016, and includes health checks, monitoring and alerting, incident management, and incident response. Provides incident management through resolution, system management subject matter expert (SME) support, escalations to vendors, internal resources, and 3rd parties. Earlier server versions which are no longer supported by Microsoft can be supported on a best effort basis. Health Monitoring, automated alerting, configuration management and incidence response are all options through the Network Device Management solution. Choose from monitoring or complete management. We support all end points including routers, core switches, access switches, firewalls, and WAPs/WALs. Our SaaS solution offers customers a way to save capital expense and infrastructure costs by utilizing a licensing subscription to our software for the management and monitoring of your network. We pass on our investment, allowing you to manage your servers and desktops, monitor your complete infrastructure, and see critical reporting for business decisions, while keeping your costs limited to operational costs only. Infrastructure as a Servcie (IaaS) solutions fulfill the need of mid-market or enterprise level organizations who are looking to adopt a cloud structure as a service to replace their current on-premise data center. Buchanan offers a best in breed IaaS model by partnering with two of the top platforms available on the market today: Microsoft Azure platform and IBM Bluemix cloud platform. Specialized SharePoint consulting and implementation for both internal and external sites. Our work includes assistance with SharePoint portals, intranets, and collaboration, including SharePoint online migrations. We are a proven Microsoft Gold implementation partner. Our services are end to end and can provide any or all parts of the process including but not limited to, consulting, design, custom development, upgrades, and migrations. Our experience in supporting an organizations’ Office 365 initiatives include Exchange online, SharePoint online, OneDrive for Business, and Skype for Business solutions. We offer all services from licensing to monthly management to device procurement, and we do it under one roof, so you have one invoice and one partner for all your Office 365 needs. The Buchanan built IT Automation platform we call ABBEY was built by the programmers at Buchanan, with real world clients, in an effort to better manage tasks and drive efficiency to our customers. The automation tool combines our management services with an automated process to perform tasks with no human interaction, providing time to focus on the larger process and business needs. Automation saves overhead by doing more with less, increases peace of mind for areas of compliance and security by providing monthly reporting documenting tasks are complete, and helps increase efficiency in your day to day business processes.